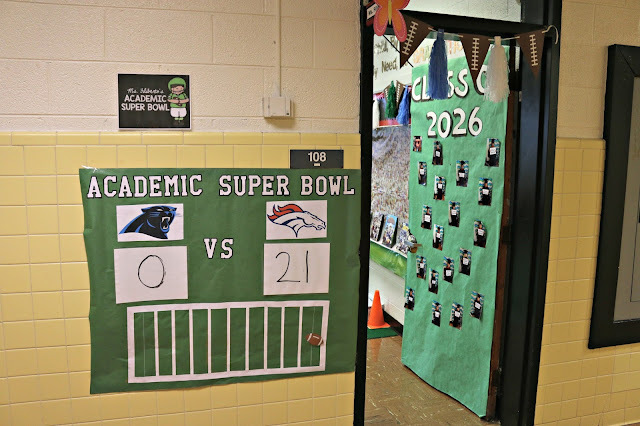 This week will be my first ever Academic Super Bowl! (See what 5 snow days does? It gives me fun ideas!) What is an Academic Super Bowl you ask? Well, it is just like the Super Bowl but you earn your touch downs through your teams average score! This is how I am doing it! 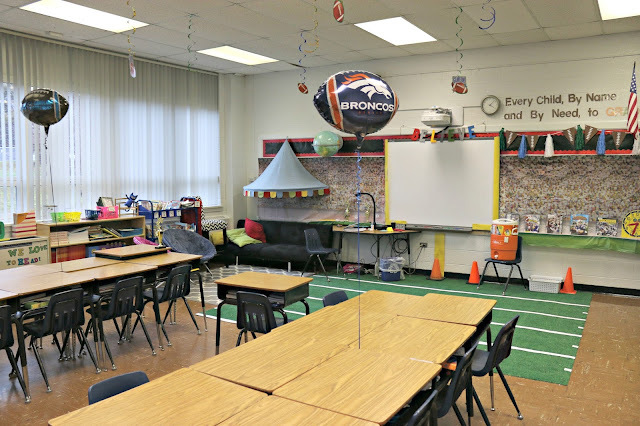 I SECRETLY divided my class into two teams, the Carolina Panthers and the Denver Broncos. I tried to make the teams even based on my their reading and math scores. 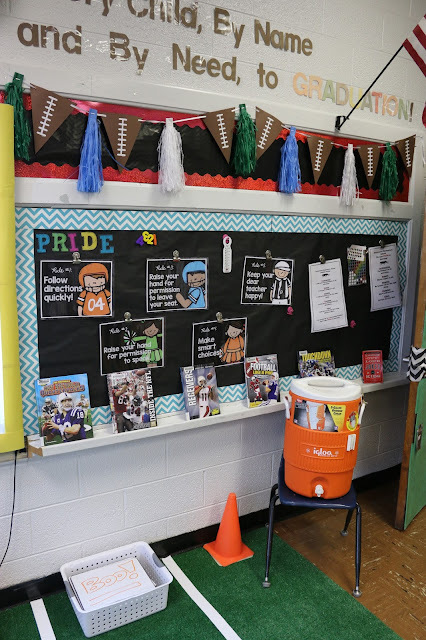 I then casually asked the class who they were cheering for so that way they could be on the team they wanted. Friday at 3:20 was Draft Day. Every student got half an index card with a scratch off. They had to scratch off to reveal their team. 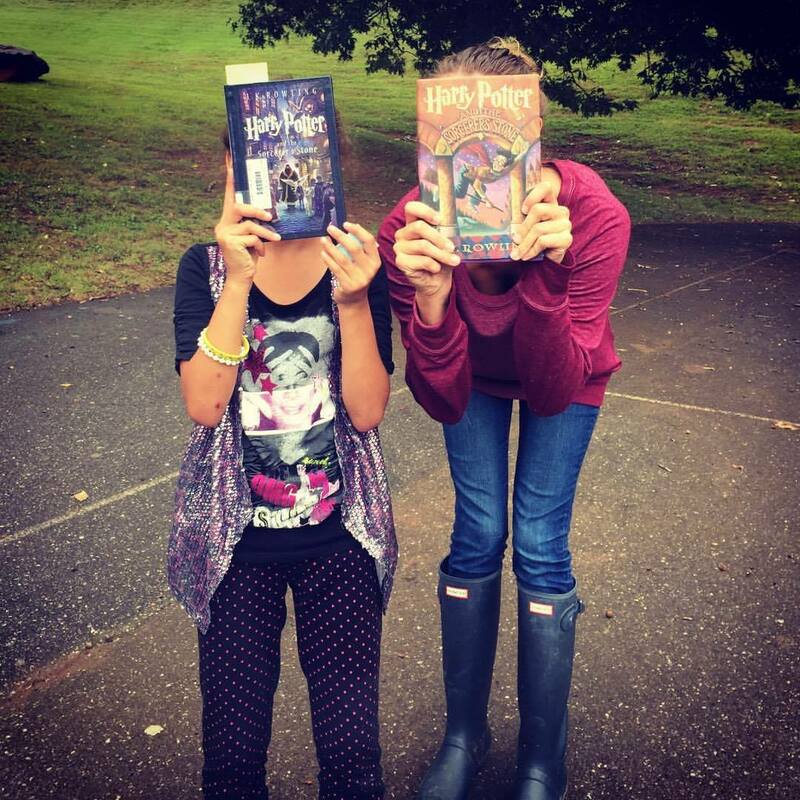 They THOUGHT it was random, but it wasn't (insert evil laugh: mwuah-ha-ha). I knew I had my Broncos logos on the top and Panthers logos on the bottom as I passed them out, and I already knew who was going to be on what team. I got my scratch offs at my local bookstore (Givens Books Little Dickens) but you can get them on Amazon. The kids loved the scratch offs so much I plan on using them again for more fun activities. 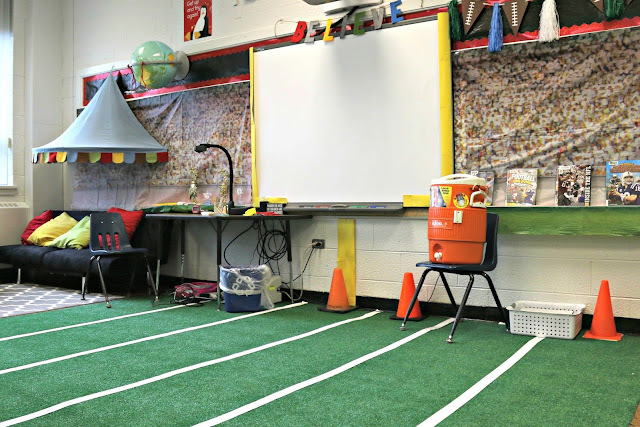 This week most of my lessons will have football incorporated in them in some way shape or form. Some things are as simple as having football clip art on the worksheets. I will be averaging the scores of each team daily, the team with the highest score gets a touchdown. Obviously this will not all be grades that go in my grade book, some will be exit tickets and practice sheets. 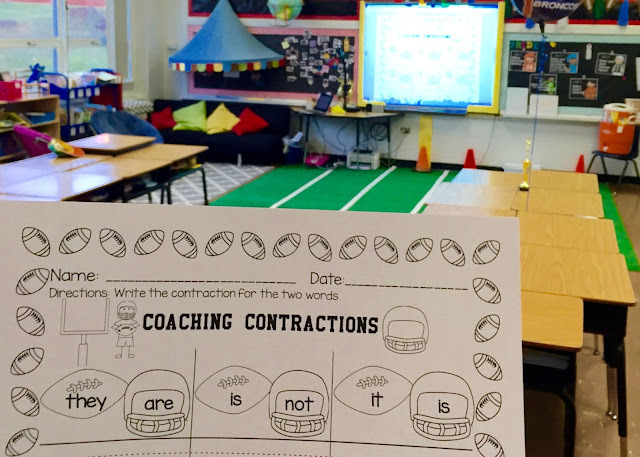 You can get my "Coaching Contractions" worksheet in my TPT shop here! 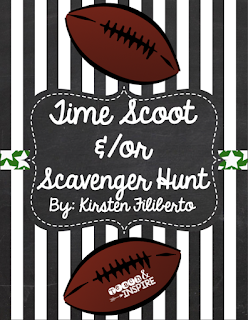 My football themed Time Scoot is FREE in my TPT store! Get it here! 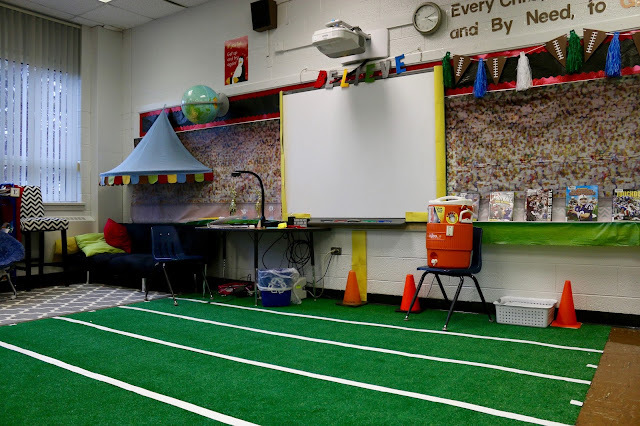 After the kids left I transformed the room! I had already decided I would stay late setting up so I ran out, grabbed food, and came back! I stayed until the custodians kicked me out! I am pretty excited with the turn out and the kids were too. I wish you could have seen their reactions! It was priceless! I rearranged the desks so my students are sitting with their fellow teammates. 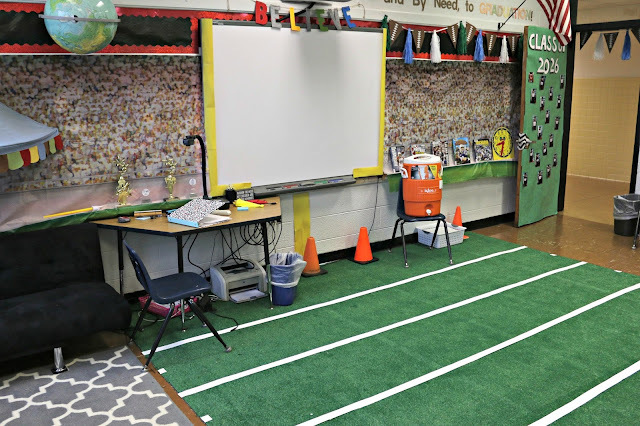 Later this week I am going to explain how I set everything up, and where I got everything so you can do it in your classroom! What do you think? Do you think it's NFL worthy?